As you’re stocking up the nursery, it’s hard to know exactly how much to get of each item. But there are some things where the rule is: you can never have enough. Below are 10 baby items you should make sure to buy in great supply, so that your first few months can start off without constant trips for restocking. Expect your newborn to pee at least five times a day and poop anywhere from once a day to eight to 10 times a day. So an ample supply of diapers is key. Until you know your baby’s size, don’t get more than a package of the newborn size, because once they hit 10 pounds, they’re ready for size 1. If you’re using reusable diapers, make sure you have at least a dozen on hand—if you plan to do laundry every day. If you are doing laundry every other day, then double it. If you think your dryer likes eating your socks, just wait until it gets a taste of your baby’s. 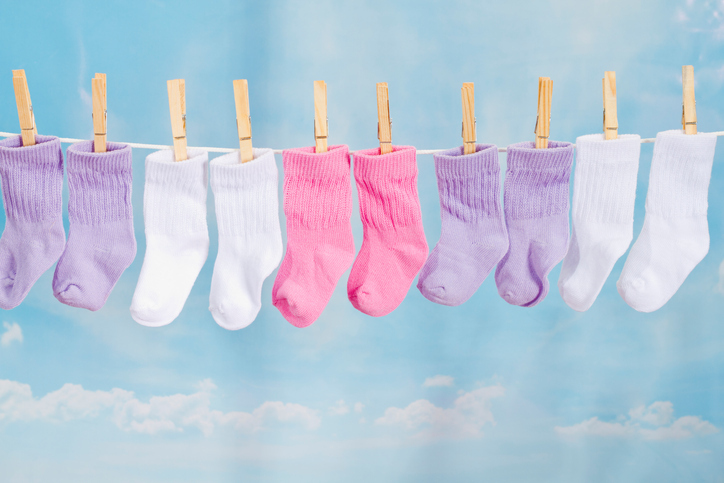 Baby socks disappear at an alarming rate, not only in the wash, but also by working their way off your little one’s kicking foot as you’re wheeling her down the sidewalk. So make sure to stock up. In the first few months, you’ll be surprised how many times your baby will pee, or even poop, mid change. Even when that doesn’t happen, a newborn’s soft poop tends to get all over the place when you’re changing her diaper. If you don’t want to constantly change your changing pad, you can also put a waterproof liner or cotton baby blanket on top and just change that. Expect your wee one to spit up continually—most likely at least once after every two-hour feeding. Since you don’t want to me changing your clothing as often as you change the baby’s, burp cloths are key. Choose designs you like, since they will be part of your wardrobe for the next three months. Burp cloths only work when you’re burping the baby. The rest of the time, your baby will be spitting up all over his or her onesie (plus the crib sheet and, possibly the swaddling blanket). There’s also the explosive poops that reach up their backs and leaky diapers. So expect to be changing your baby’s onesie several times a day. As we mentioned above, it’s perfectly normal for a newborn to poop as much as 10 times a day and you’re going to need plenty of wipes to clean it up. You’ll also find yourself using the wipes to clean spit-up from your baby’s face and neck and from your own clothes when you don’t have the time (or energy) to change. If you want to save money, a wet paper towel or washcloth works just fine. You’ve probably got the idea by now, but you’re going to be going through an awful lot of sheets for your baby’s crib, bassinet or co-sleeper, thanks to errant pee, poop and spit up. Have an ample supply on hand. To prevent and treat diaper rash, you’re going to be using a lot of diaper cream, especially between 9 and 12 months. Diaper cream is nothing you want to stint on, so make sure you have plenty at every changing station in your house, as well as in your diaper bag. You’re only going to want to bathe your newborn about three times a week in the beginning to protect his delicate skin from drying out. However, you’ll find yourself using washcloths for everything from cleaning her face, neck and hands after feedings to cleaning your own neck and hands after a spit up. Most newborns find being swaddled incredibly comforting, so you always want to have a clean one on hand. You can get specially designed blankets, such as the Miracle Blanket, or SwaddleMe, or wrap your little one up burrito style in a lightweight square-shaped blanket, but either way, most parents find swaddling to be a late-night lifesaver.